Chevrolet Silverado 1500 kit allows you to quickly and easily repair your shift cable by replacing the bushing. The patent pending coupling and custom molded replacement bushing ensures a quality repair with ease. A professional can perform this repair in under 5 minutes, average time for a non-professional is less than 10 minutes. This bushing is made from a material that was designed to outlast the factory bushing and includes everything needed to install. Great fix for my 2003 Silverado !! Worked exactly as they said. Very easy to do, it took longer to put the truck up on jack stands. It seems very snug and I think it will last for a long time. Product works as advertised. Wasted $30 dollars at the local parts store with no luck. I also replaced the rusted arm ($10) that the bushing fits over. It's been several weeks and still works fines. It took me 2 minutes to pop out the old one and install the new bushing. The linkage snapped on to the stud with a secure feel and has been on for a week now. $25 seems a bit high for a tiny piece of plastic but the alternative is buying a whole new cable. Product works as expected. I don't drive the vehicle often so I won't be able to say for long it will work but I'm not expecting any issues. The purchase and delivery were smooth and efficient. So why not 5 stars? Well, I believe it is a little pricey for the product 25 + shipping becomes ~$35. 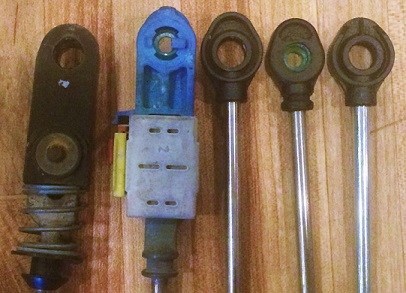 Which would be okay except you only get one little bushing which can easily be dropped and lost. Would I buy this product again? Yes. Didn't fit properly, made one shift and it was done. 2006 chevy silverado bushing kit. 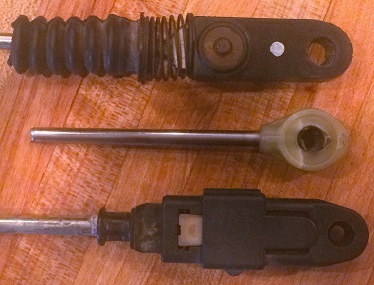 Prior to ordering this part, I had the stripped-out cable end zip-tied to the transmission shift lever. It works ok but you can't get down in your lower gears without stressing the zip-tie, and you probably would not want your wife driving the truck for very long like that. I removed the old bushing completely like the instructions say, but I'm not sure I needed to, or even should have. The bushing pushed easily ( a little too easily for me) onto the cable opening. No orange tool needed.